MISSION, KS--(Marketwired - Jun 6, 2013) - (Family Features) All you need to recover from the hectic pace of daily life is a day in the great outdoors. This season, explore the open waters for yourself by treating the entire family to the world of fishing and boating. According to a recent survey, Americans cite relaxation, stress relief, time with family, the thrill of the catch and connecting with the outdoors as what they appreciate most about fishing. Not only are these activities fun and affordable, they provide lasting memories for all to cherish. 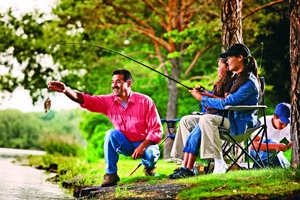 Fishing is easy and enjoyable for the whole family. And, it's simple to get started. If you're not sure what you need or want a refresher course, TakeMeFishing.org is a website that helps people of all ages and experience levels learn, plan and equip for a successful day on the water. How to Fish - Need a beginner's guide to fishing? The website's Fishopedia section has information about specific fish species, where they live and how to catch them. For kids, the site's Little Lunkers pages help develop fishing skills and knowledge before getting out on the water. Where to Fish - Find your perfect local fishing and boating spot with an interactive map that guides you to your nearest parks, bodies of water, fishing spots, campgrounds and more. Where to Boat - Download a free app free app to find places to launch or dock boats, including more than 35,000 boat ramps and marinas across the country. Connect and Share - Connect with others to view and share photos, plus read expert blogs and forums to help guarantee you have the best day on the water. There are just a few items you'll want to pack to enjoy your day. You can gear up with the basics -- a rod and reel combo, tackle kit, and bait -- at local sporting goods stores, large retailers and bait and tackle shops. For all on-the-water festivities, be sure everyone has a life jacket, a current fishing license, and that any boat being used meets registration requirements. Licenses and registrations can be purchased for your state online. While you're out, be sure you have proper sun protection. This includes sunscreen, sunglasses and a hat to protect skin and eyes from the sun's rays. You may also want to bring some insect repellant. Most people don't realize when you purchase a fishing license, you're giving back to local conservation projects, helping protect, preserve and enhance the nation's waterways for generations to come. So, round up the kids and head outside to enjoy all the season has to offer. Remember, some of the best memories are caught while fishing and boating.